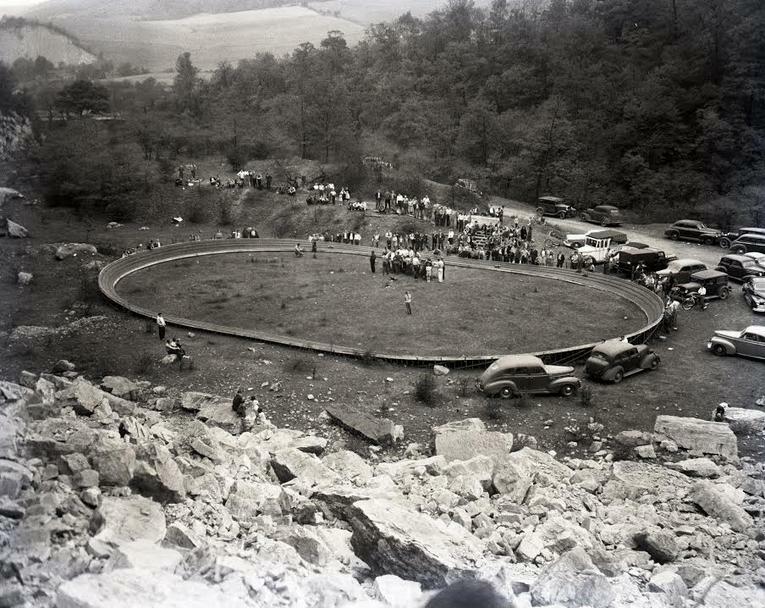 The Tyrone Miniature Speedway was located just outside Tyrone, PA on the site of a ballast quarry owned by the family of Jack Vanneman. The four-rail, 1/16th mile rail track was built as a class project by students enrolled in the carpentry program of the National Youth Administration, a New Deal agency of the federal government which operated from 1935-43 as part of the Works Progress Administration (WPA). Much of the success of the Tyrone track resulted from the efforts of Jack Vanneman, an active rail track racer and the eastern distributor of the Curly Glover-designed Curly Cars. 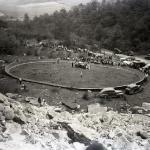 In an effort to attract more participants, Vanneman scheduled mite car racing on the Tyrone rail track on Thursday evenings during the 1950 racing season. And in support of this "Thursday Nites for Mites" initiative, Vanneman modified several Real McCoy mite cars by attaching a set of rail guides to the pan in place of the usual pan handle originally mounted on the stock tethered versions of the car. 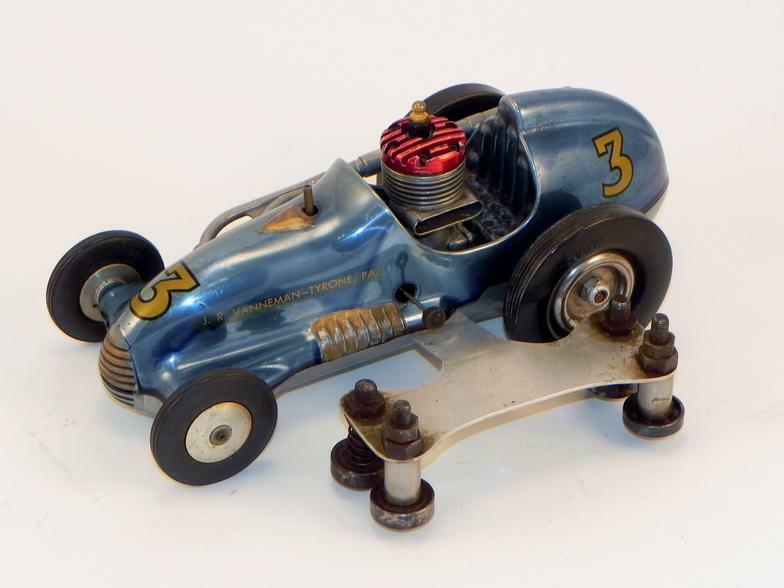 Vanneman kept one of the modified Real McCoy cars for his personal use, and gave the other modified Real McCoy cars to prospective competitors, hoping to stimulate their interest in the hobby. Vanneman's personal car was extensively modified beyond the mere attachment of rail guides. 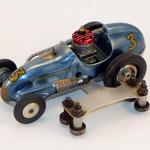 His car featured a custom fuel tank and custom two-piece aluminum front wheels with ball bearings mounted on a custom sprung front axle. Vanneman's personal car, in his familiar orange and black #2 livery, is shown in the photos along with the blue #3 car which was given to a fellow competitor. Unfortunately, the popularity of mite car racing on the Tyrone track did not meet Vanneman's expectations. 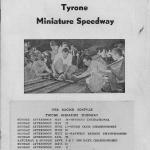 Only a handful of cars turned out for the Thursday evening races and the experiment with mite car racing on the Tyrone rail track lasted only through the 1950 season. 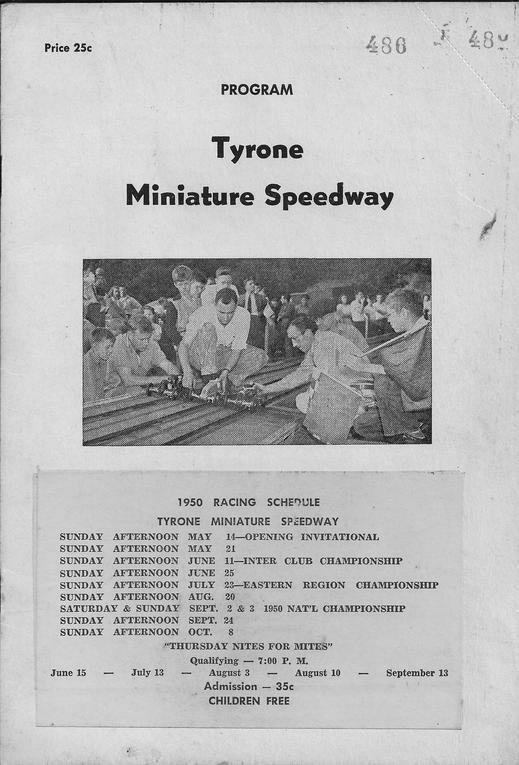 The Tyrone track hosted its last formally sanctioned races in 1952. Eventually a new highway was built through the site of the storied rail track.